Foto Zombie is composed of a series of photographs, originally the property of Juan O’Leary, director of protocol under Stroessner’s regime, that were acquired by the artist at a flea market in Asunción in Paraguay. Casco worked on the backs of the original photographs, where the subject of the picture was also noted. He traced in pencil the contours of the silhouettes of the figures and events that are on the front of the photographs. 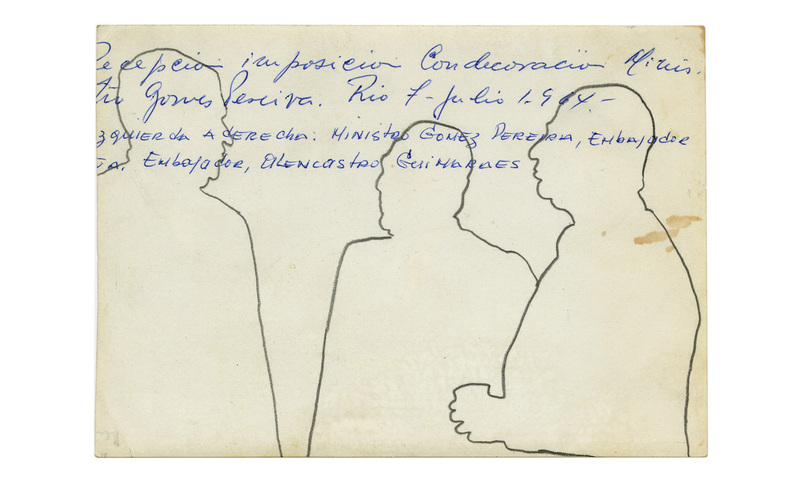 These modified documents are an open critique of official protocol—the actions and gestures—that promote and support authoritarian regimes, such as General Alfredo Stroessner’s cruel dictatorship in Paraguay (1954–89). Born in 1967 in Asunción, Paraguay. Lives in Asunción, Paraguay. After earning a law degree, Fredi Casco became an artist and writer in 1998, mainly working with photographic images that he collects, as well as videos and installations. Through the seminario de Critica Cultural organized by Ticio Escobar in 2003, he was awarded a grant from the Rockefeller Foundation in Asunción. He also received a CIFO grant for emerging artists from the Cisneros Fontanals Foundation of Art in Miami in 2007. His work challenges the power of the media and compares the historical importance of official culture with that of popular and indigenous culture. He examines the transparency and neutrality of television and print media, and reveals certain media strategies of the postcolonial system in place in Paraguay. His work has been presented in group exhibitions such as the 3rd and 5th Mercosul Biennials in Porto Alegre in 2001 and 2005, the Valencia Biennial in Spain in 2007, Efecto Downey at Telefonica Foundation in Buenos Aires in 2006, the 2nd Biennial of Contemporary Art in Thessaloniki, Greece in 2009, and the 10th Biennial in Havana in 2009. He was also part of the El Atlas del imperio exhibition organized by the Italian-Latin American Institute at the 55th Venice Biennial in 2013.